I firmly believe that Meryl Streep is the best part of every film she's a part of. She's received critical acclaim for everything from her performance as a cold, perpetually-poised fashion magazine editor in The Devil Wears Prada, to a boisterous famous chef in the making in Julie & Julia, to the whip smart (but complicated) leader of England in The Iron Lady. Frankly, I think Streep could star as a farm animal and the buzz would be whether she's going to take home the Oscar this year for her performance. There are simply no surprises left when it comes to Streep's historic career. Or, are there? According to Deadline, Streep may star in upcoming TV show The Nix , and it's proof that TV has finally gotten to a place where top-level film actresses want to be. As reported by Deadline on Thursday, Warner Bros. Television is close to closing the deal for The Nix, which would be based off a book by Nathan Hill. The novel revolves around a professor whom, when strapped for cash, decides to write a scathing profile about his own mother. 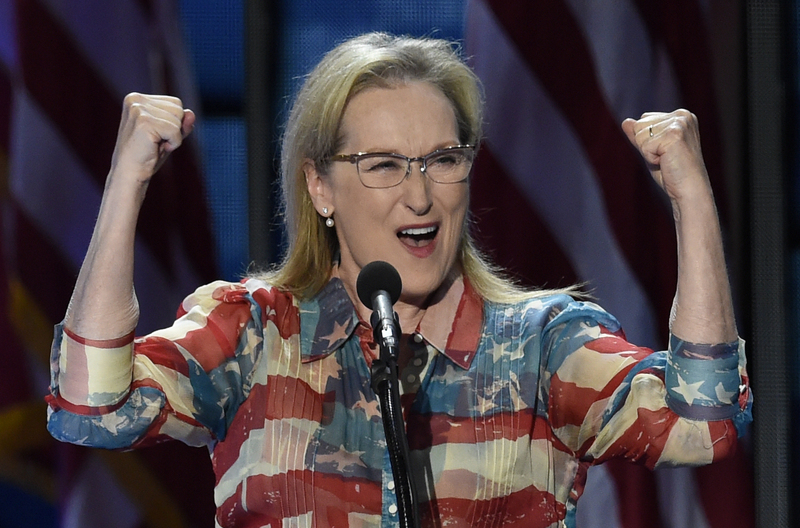 The role of his mother, a "hippie-era" woman who came under fire for throwing rocks at a conservative politician, is the one Streep is in talks for, as Deadline reports that the Doubt actress may both star and produce this new "limited series." J.J. Abrams is also onboard to produce, and plans to direct a few episodes of the series, adding to the clout of the new project. Of course, it's Streep's name that stands out the most when coupled with the word "TV." This is of course because Streep's name is generally synonymous with Oscar buzz and big screen performances, so it's quite surprising that the star is making the move to the small screen. However, given the state of television, it only seems right that Streep makes her move. We're in a sense living in the "golden age" of television — a time in which some of the best stories are being told outside of the movie theater. Just take a look at the spectacular performances (and equally as spectacular costuming and sets ) of HBO's Game Of Thrones: it may not be eligible for an Oscar, but it's certainly elevating the standards of what we expect on television. It's not just premium cable networks like HBO that are producing quality content that rivals what we see on the big screen. USA Network's Mr. Robot challenged the network's standard procedural series format and gave the world a show that felt like a cross between Fight Club and Hackers. Netflix's Stranger Things even felt like a multi-part movie with its complex mythology and expansive sets. Streep isn't the only A-list actresses who decided to make the leap to TV: according to Variety, both Nicole Kidman and Reese Witherspoon will star in Big Little Lies on HBO. It seems that TV is becoming a hospitable home for film actors to try something different, and while they may return to working on projects that could get them Oscar nods, Streep's upcoming role has solidified that this trend isn't going anywhere.